Catherine's Manifesto of 1763 promised religious freedom for the colonists and the Russian government took this promise seriously. To build in every settled district one church complete with all necessary furnishings and a suitable home for the pastor, at the treasury expense for the inhabitants of the entire district, exempting those expenses for the course of the privileged years from each household at an equal number. The Russian government believed that this provision of the Manifesto was necessary because the colonists, "in view of their poverty, are not in a position to construct them." The cost of constructing the churches was added to the colonists debt which was to be repaid after 10 years of settlement. 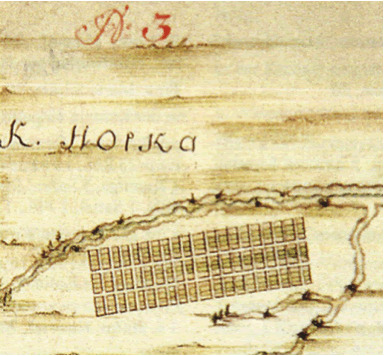 Plan for Kolonie Norka drawn by the Russian government circa 1768. Source: "Einwanderung in das Wolgagebeit - Band 3." By decree of the Governing Senate on May 14, 1767 surveyors were instructed to to set aside land for each church at 609 desyatina (a Russian measure of land where 1 desyatina equals roughly 1.1 hectares). To this purpose Count Orlov brought together a team of 24 experts from the Cadet-Engineers and Artillery Corps of the army under the leadership of Colonel Ivan (Johann) Reis, a man of the noble rank and a collegial assessor. In those days, it was the army that performed the state’s civil engineering projects. All of those selected were expert land surveyors and geodetic surveyors. In an effort to avoid repetition of the religious conflicts of central Europe that had plagued most of the seventeenth and eighteenth centuries, the Volga German colonists were assigned to colonies based largely upon their religious affiliation. As a result, the colonies were made up primarily or exclusively of one of three religious groups: Evangelical (what we would today call Lutheran), Reformed and Roman Catholic. There were also a small number of Mennonite colonies in the Volga settlement area. In the early years after the founding of the original colonies, there were sixteen churches and their schools and pastors' homes were based on the number of parishes: eleven Protestant and five Catholic. The first Protestant parishes were established in 1767: Talovka (Beideck), Lesnoi Karamysh (Grimm), Podstepnaya (Rosenheim), and Sevastjanovka (Anton). Ust-Kulalinka (Galka), Medveditskii Krestovyi Buyerak (Frank), DeBoff (in Oleshnya or Dietel), Norka, and Beauregard (in Katharinenstadt) were established in 1768. LeRoy (in Privalnaya or Warenburg) was established in 1770 and Vodyanoi Buyerak (Stephan) in 1771. Catholic churches were established in Tonkoshurovka (Mariental) and Kozitskaya (Brabander) in 1767. Kamenka and Krasnopolye (Preuss) in 1768 and Paninskaya (Schönchen) in 1770. 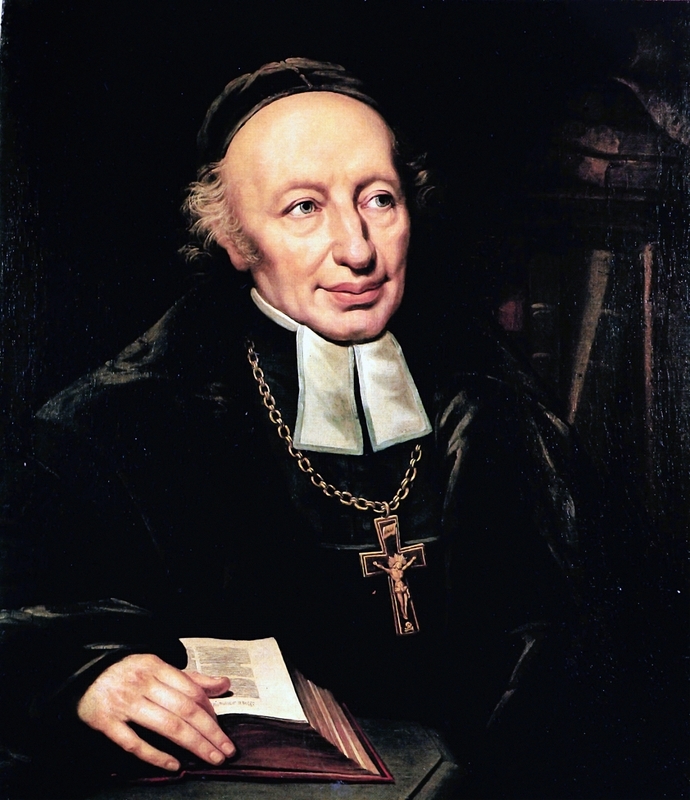 Igor Pleve cites documentation of 19 parishes established by the Kontora in 1777, 9 Lutheran, 3 Reformed and 7 Catholic. ​During the early years of settlement in Russia, the Volga German suffered from a lack of pastors to serve the colonies. Despite the great preponderance of Protestants, few pastors came or stayed with the colonists due to the meager salaries of the clergy who were faced with ministering to scattered parishes often numbering over 2,000 souls. In the 1798 Russian Census, Court Councilor Popov describes the colony of Warenburg and states that while the Lutheran families had their own pastor, the Reformed faith families do not belong to any parish, but when necessary they call upon the pastor from Norka. The lack of pastors continued to be an acute problem. By 1805, there were only fifteen Protestants pastors in the entire colonial enclave, these living in Messer, Grimm, Beideck, Galka, Dietel, Frank, Norka, Stephan, Yagodnaya Polyana, Saratov, Rosenheim, Warenburg, Bettinger and two in Katharinenstadt. Protestant seminaries were eventually built to provide students with a better chance of studying closer to home. Despite this fact, shortages persisted and even up to 1910, there were between three to five colonies in a Kirchenspiel (parish). Adam Giesinger writes that, "It was difficult to attract Protestant pastors to the Volga in the early years, and even more difficult to hold them there." Giesinger goes on to say that, "As life became more bearable in the Volga colonies the number of Protestant pastors who came to stay gradually increased." "It appears that there were not too many outstanding men among the pastors who served in the Volga colonies that first 50 years. Three of them, however, Janet, Cattaneo, and Huber, all Reformed, seem to have been above the ordinary." All of these men were trained in Switzerland. The University of Dorpat (now the University of Tartu) in Estonia was the nearest theological school but the great distance and expense virtually prevented enrollment by eligible Volga German men. James Long provides a brief history of the early church leadership and efforts to reconcile the Lutheran and Reformed faiths: "In 1819 (July 20th), the government (of Czar Alexander I) attempted to erase, if not reconcile, differences between Lutherans and Calvinists (Reformed) by placing all Volga German Protestant parishes under the jurisdiction of the newly established Protestant Consistory in Saratov. Under the energetic leadership of a former priest and orientalist, Ignatius Fessler, the differences in the practices and liturgy of the two denominations narrowed as a common hymnal and liturgical manuals were adopted and annual synods convened to discuss church affairs and to resolve problems. The Reformed Church had become so administratively integrated within the Lutheran parishes, and the two denominations' liturgical differences were so inconsequential, that in 1832 the consistory was renamed Lutheran and incorporated into the distant Moscow Lutheran Consistory (later called the National Church Council), which supervised congregations in various parts of the empire." The Moscow Consistory was responsible for inspecting the schools and churches and to preside over the annual synods of the pastors. Painting of Ignatius Aurelius Fessler by János Rombauer during his service in Saratov (31 Dec 1820). Source: Wikimedia Commons (public domain). 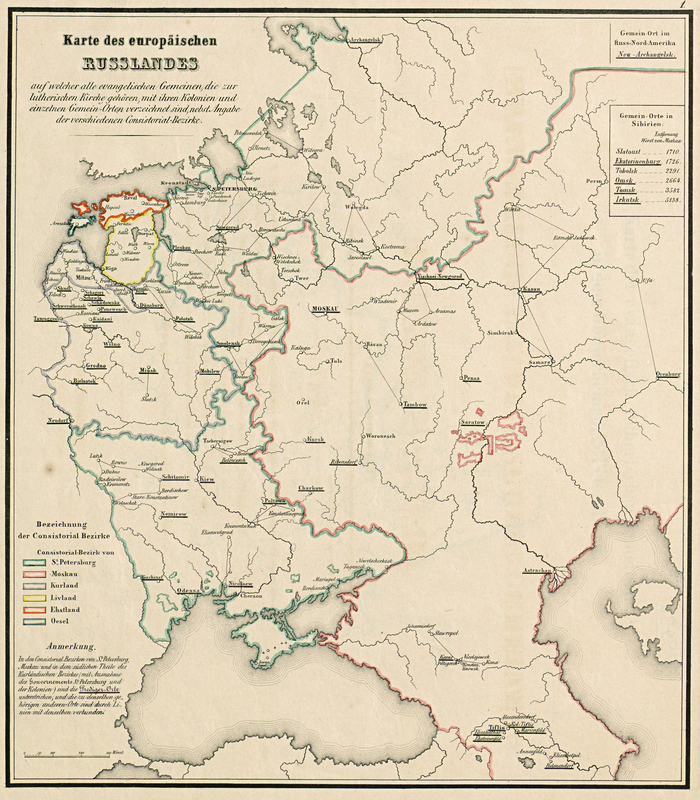 Map titled "Karte des europäischen Russlands" dated 7 March 1855. Used with permission of the Basel Mission Archives Reference (BMA ATL-31.011.0010). The map shows the various Lutheran consistories, including Saratov and Moscow. 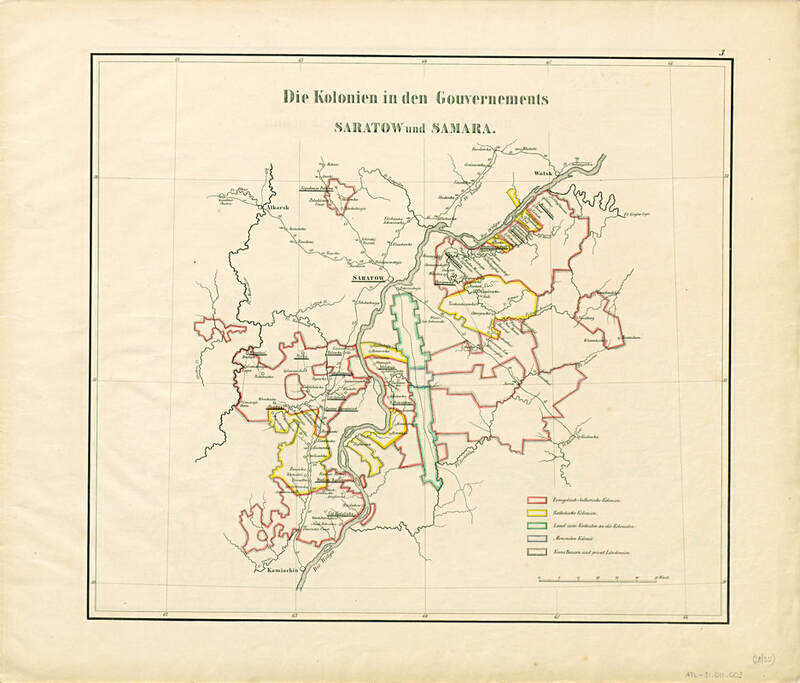 Map titled "Die Kolonien in den Gouvernements Saratow und Samara" (dated 7 March 1855). This map shows the Protestant, Catholic and Mennonite settlement areas and the Protestant parish centers. Used with permission of the Basel Mission Archives (BMA Reference No. ATL-31.011.003). Norka became a Pfarrkirche (parish church) which included the two Filialkirche (affiliated churches) of Huck (Splavnukha) and Neu-Messer. By 1906, Joseph Schnurr states that the parish had a church membership of 23,179 souls served by one pastor. Another source provides the number of parish residents over various years: 12,832 (1886), 17,827 (1894), 20,700 (1905), 24,040 (1911). The pastor lived in Norka since it was the largest colony and parish center. A parsonage was built in Norka for the use of the pastor. From Norka, the pastor traveled to each congregation within the parish nearly every week operating much like circuit riders in the United States. He had a semi-regular schedule of getting out to his villages, to perform weddings, confirmations, baptisms, and funerals. He nearly always signed his name along with the parish church center but it did not mean he was physically present. In his absence the Schulmeister (schoolmaster) performed these duties. This also explains the mass weddings that were held in these smaller parish villages. When the pastor came to town, a whole group of weddings were often performed on the same day. The clergy, in addition to a state salary, were granted a payment of 180 rubles, which was secured by way of a special collection (Steuer) from the colonist's families. Large families paid 96 kopeks, medium families paid 80 kopeks and small families 64 kopeks. In addition, a clergy received a free horse for travel and an additional payment for maintenance of his own horses at a rate set by special negotiation with a member of his parish as verified by the district commissar. The pastor also received payment of wheat, rye, barley, hay, potatoes, and wood. On average, the salary of a clergyman reached 500 to 600 rubles as opposed to a common laborer who earned about 12 rubles per year. Jacob Dietz suggests that pastors were quite well compensated and would on occasion have interests at odds with villagers. Colonists supplied most of the compensation a pastor received, other than the 180 rubles paid by the government annually (which gave them some protection against inflation, which paper money would not). For almost 100 years, payment was made in kind (so many pud of wheat or rye, or faden of firewood, or bales of hay, etc.) per family. So the more families per village, the more compensation for a pastor. The colonists, however, got tired of the crowding and difficulty of making a living as the population grew quickly, and wanted to move to open areas which reduced the payments to the pastor. This seems to have been settled by a shift to compensation of pastors by a mainly fixed amount of money paid in salary by the congregations of a parish, other than religious rights, where the fee was fixed for baptisms, confirmations, marriages, and funerals, but the more of any of these, the more income. And more land opened up at around the same time, and villagers were able to move to these new areas. According to Pastor Eduard Seib, as a rule the pastor and the schoolmaster were respected personalities. One asked them for advice and also usually received good advice. Because of this the saying “The pastor said so” usually dismissed any statement to the contrary. One shows respect toward him by one’s behavior. If he takes a stroll through the village when the gate benches are still occupied then all stand up when the pastor passes by and even the oldest people remove their head covering and address a greeting to him in a friendly and respectful manner. The same is true of the relationship between the schoolchildren and the schoolmaster. However, such deference is also shown toward the priest at home (Translator’s note: This is in reference to the Christian teaching emphasized by Dr. Martin Luther that the father of the house is also the pastor of the home). When one walks past an elderly man one moves to the side and in doing so says good-day first. It is considered immodest to smoke in front of an elderly man, the schoolmaster or the pastor. Any members of the congregation who have an especially close relationship with the pastor or the schoolmaster often make them glad by giving them some kind of practical gift. Both of them receive shortcakes from these members at weddings and on major holidays. Each of them also receives a sausage or another meat product from the feast held after butchering is completed (the Metzelsuppe). However, despite the fact that they are held in great esteem and respected, now and again there are differences of opinion between a pastor and his congregation. This seems to be more prevalent in two situations. Differences of opinion are almost unavoidable when the construction of a new church is planned or when a new schoolmaster is to be hired. The wishes and opinions of both parties are often at loggerheads with each other and a lot of effort and much patience are required until everything has come to its proper conclusion. If the pastor appreciates his people and they see that he means them well then the pastor is assured of winning. The people usually put up a little resistance because it “does bother them a bit,” but in the end they agree with him and are satisfied. ​A native Volga German, Pastor Wilhelm Stärkel (Translator’s note: His name was spelled Störkel until 1859. He was born in 1839), a graduate of the Mission Seminary in Basel (Switzerland), once dealt with the members of his parish in a curious way. He employed the colonists’ belief in dreams. They do not always consider dreams to be illusions. After one of his congregations had been entangled in a dispute about which schoolmaster was to be selected and as yet no end to the dispute was in sight he began a sermon which he held there with these words: “I had a dream last night! (Everyone played close attention!) I was in hell and wanted to visit Satan one time. It was pitch-dark around me. Only from a great distance did I perceive a bright light. I thought that he was probably raking his fire there. I walked in the direction of this light and it became brighter and brighter all the time but I could not detect that Satan was anywhere. When I was finally right next to the fire I discovered a little devil that was doing something to his foot. I turned to him and asked him where Satan and his angels could be. I would really like to see them. “Yes” said the imp in a whining tone of voice, “They are all in Hell, there is a vote being held there in order to elect a schoolmaster for the congregation.” (All the people in the worship service lowered their heads.) “I would have really liked to go along (with Satan and his angels) but I have a bad foot and because of that I had to stay at home.” That very afternoon a schoolmaster was elected to the satisfaction of the pastor and later to the satisfaction of the congregation as well. Despite respect and reverence on the part of the people, a pastor could also become the victim of satire. This is exemplified by a poem about Pastor Jakob Friedrich Dettling which, in fact, is supposed have been written with the aid of an educated man (a certain Professor Ascher who was allegedly from Heidelberg). Pastor Dettling was the pastor in Messer where he served from 1855 to 1891. An unpretentious, honest Swabian, also educated at the Basel Mission Seminary, a man with a rugged exterior and a mighty preacher of repentance gifted with the voice of a lion. He is supposed to have seen and read this poem while he was still living. Und setzt sich vor sein Tor. Die Zeit wird ihm nicht lang. Und hilft oft mit der Tat. Bis daß er heftig schreit. Den Sündern wird es bang. Noch, wie’s von jeher war. Hält er für seine Pflicht. After the Bolshevik Revolution in 1917, the church lost much of its authority. More than 1,000 church schools were closed and they no longer owned their buildings. The Bolsheviks confiscated all valuable religious objects by force. Between 1917 and 1937, 130 of the 350 Protestant pastors were arrested and suffered from repression, 15 pastors were executed by shooting, 22 died in prisons, and more than 100 emigrated from Russia. By 1938, all of the churches were closed and the church as a organization became extinct. Dietz, Jacob E. History of the Volga German Colonists. Lincoln, Neb. : American Historical Society of Germans from Russia, Printed by Augstums Printing Service, 2005. 114. Print. Giesinger, Adam. From Catherine to Khrushchev: The Story of Russia's Germans. Winnipeg, Man. : A. Giesinger, 1974. Print. Long, James. From Privileged to Dispossessed. Lincoln, Nebraska: U of Nebraska, 1988. Print. Der Wolgabote Kalendar 1891. Saratov, Russia, Verlag von W. Himmel, 1890.